Hudson Baby 5 pack headbands are made of soft, 92 percent cotton 8 percent spandex for a gentle and cozy fit for your little one. 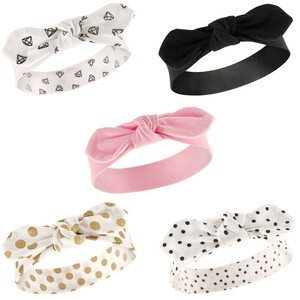 Whether holding hair back or just for a fun accessory, one of these headbands will always be up to the task. This pack comes with solid and printed headbands, so you'll always be able to mix and match perfectly with the rest of baby's outfits. These headbands fit 0-24 Months.